In honor of Fantasia‘s upcoming 70th anniversary, we’re giving a shout out to composers featured in the film all month long. Take it away, J.S. Bach! J.S. Bach was — and is — famous for his organ works, choral works and sacred compositions. His music remains a staple in performed music literature as well as musical study for almost every musician across western genres. Bach’s father taught him to play the harpsichord and violin. 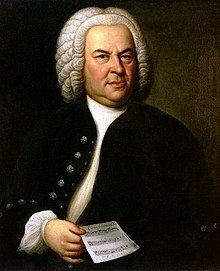 Upon being orphaned at age nine, Bach moved in with his oldest brother and began singing with a local monastery and later performed as an instrumentalist with the group. He later held positions as court organist for the Duke of Sachsen-Weimar, the Dresden Court and King Frederick II of Prussia, among others. Bach’s organist positions tended to be flexible enough to allow him to compose as much as he pleased. How fortunate for generations of music lovers! Some of Bach’s famous works include his cantatas (he wrote one each week! ), masses, Brandenburg Concerti, and so many more. Today we feature Toccata and Fugue in d minor, which was composed between 1703 and 1707 and is among the most famous works in organ repertoire. « Salon97’s First Official Fundraiser!